The Cervélo P3 has for a number of years now been our best-selling triathlon and time trial bike, the top choice for every discipline from local 10-mile TT to sprint triathlon to Ironman; and for every athlete from newbie triathlete to Kona veteran. For us, it's the blend of category-leading aerodynamics, a geometry that allows riders of all shapes and sizes to achieve a comfortable position and the simplicity of its non-proprietary components allowing stress-free packing and travel that makes it such a surefire choice. Its pedigree on the pro circuit - the P3 has more professional wins than any other bike - adds to the psychological benefit of riding a bike that will allow you to reach your full potential. A wider range of storage and hydration options, including top tube and downtube accessory mount bosses, and an integrated seatpost accessory receiver make this a user-friendly ride over the longest distances. Future-Proof Cable Management fits mechanical, electronic, and hydraulic systems for easy upgrades and direct-mount downtube battery bosses make maintenance easy. Cervélo knew the extreme hours you put into training – and they, like us, don’t think "suffering" should have anything to do with your frame. 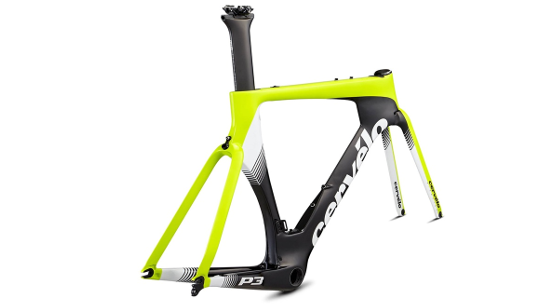 The P3 is designed with enhanced fit flexibility, offering sizes 45 (650c) and 48 (700c), and an 11⁄8” steerer for a wide range of aftermarket cockpit options. Cervélo’s all-carbon aero, rail-adjust seat post offers ~75mm of fore/aft adjustability. Headset - FSA IS2 1-1/8 X 1-1/8"